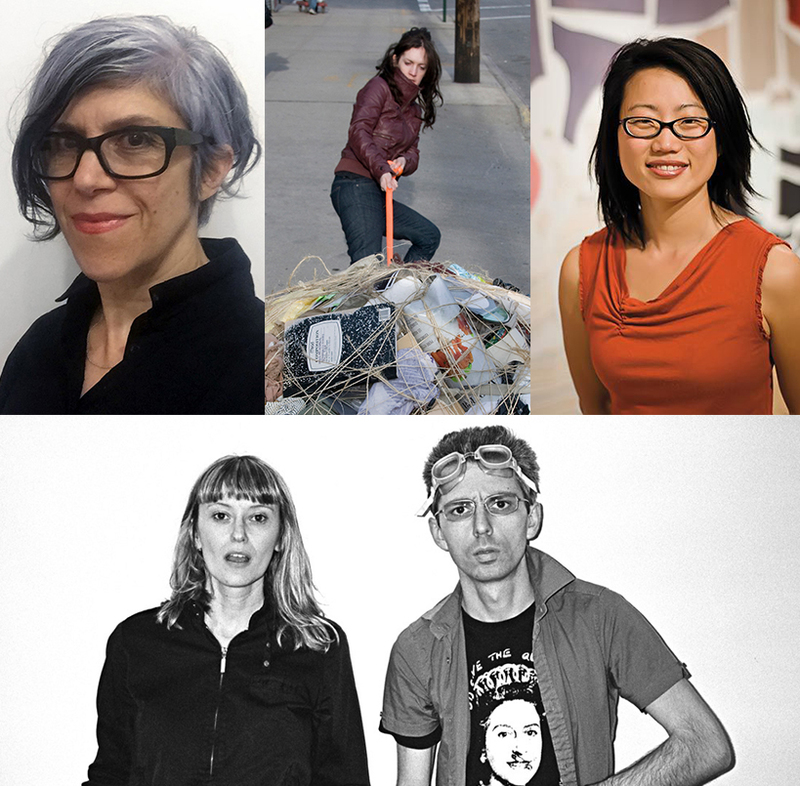 Join us for a conversation moderated by Penelope Umbrico, and including artists Jean Shin, Mary Mattingly, and Eva and Franco Mattes, who all employ technology in their art. This program is taking place in conjunction with Penelope Umbribo's MONUMENT exhibition. Penelope Umbrico is a prominent mid-career, Brooklyn-based artist. She has exhibited at such institutions as the International Center of Photography, the Museum of Modern Art, MoMA PS1, MassMoCA, San Francisco Museum of Modern Art, Le Mois de Photo a Montreal Photo Festival, The Photographers’ Gallery in London, and numerous others internationally. Her work is represented in the collections of the Guggenheim Museum, Los Angeles County Museum of Art, the Metropolitan Museum of Art, the Museum of Modern Art, Perez Art Museum Miami, and San Francisco Museum of Modern Art, among others. She is the recipient of a Smithsonian Fellowship, a Guggenheim Fellowship; a John Gutmann Photography Fellowship Award, a Deutsche Bank Fellow/New York Foundation of the Arts Fellowship, an Anonymous Was A Woman Award; a New York Foundation for the Arts Fellowship; and an Aaron Siskind Photographer’s Fellowship. Her publications include Penelope Umbrico (photographs) and Range, both published by Aperture, New York. Jean Shin is nationally recognized for her monumental installations that transform everyday objects into elegant expressions of identity and community. Distinguished by her meticulous, labor-intensive process, and her engagement of community, Shin’s arresting installations reflect individuals’ personal lives as well as collective issues that we face as a society. Her work has been widely exhibited in over 150 major museums and cultural institutions, including solo exhibitions at The Museum of Modern Art, NY; Fabric Workshop and Museum, Philadelphia; Smithsonian American Art Museum, Washington DC; Scottsdale Museum of Contemporary Art, Scottsdale, Arizona; and the Crow Collection, Dallas, TX. Her works have been on view at the New Museum, NY; Museum of Fine Arts Houston, Texas; Museum of Fine Art Boston; Brooklyn Museum; Barnes Foundation, Philadelphia; PA; Queens Museum; and the Museum of Art and Design and Asia Society Museum, both in NY; among other prestigious museums. Shin has also realized large-scale, permanent installations commissioned by major public agencies. She recently completed a landmark commission for the NYC MTA’s Second Ave Subway at the 63rd Street Station. Shin has received numerous awards including the two New York Foundation for the Arts Fellowships in Architecture/Environmental Structures (2008) and Sculpture (2003), Korea Arts Foundation of America, Pollock-Krasner Foundation Grant, Asian Cultural Council, and Louis Comfort Tiffany Foundation Biennial Art Award. Born in Seoul, South Korea and raised in the U.S., Shin attended the Skowhegan School of Painting and Sculpture in 1999 and received a BFA and MS from Pratt Institute in Brooklyn. She is tenured Adjunct Professor of Fine Art at Pratt Institute and lives and works in Brooklyn, NY. Eva and Franco Mattes (both born in Italy in 1976) are a duo of artists based in NY who have worked together since 1994. Operating under the pseudonym 0100101110101101.org, they are pioneers of Net Art. Their practice inhabits the web and skillfully subverts mass media to ultimately expand into and affect the physical space. Their controversial interventions, often bordering on illegality, challenge dominant power structures, including the hierarchical status of the art world, and explore the impact of technology in modern society. Moving beyond the classic understanding of fact and fiction until they become indistinguishable, their actions interweave the “real” and the “virtual” space to create complex open-ended narratives that present a mirror to society, emphasizing the multiplicity of personalities that construct our identity. The artists’ strategies to disrupt and critique the status quo involve plagiarism, hacktivism and culture-jamming. They created and released a computer virus, exhibited in the Slovenian Pavilion at the 49th Venice Biennale, erected fake architectural heritage signs, ran a media campaign for the non-existent action movie, United We Stand (2005), convinced the populace of Vienna that Nike had purchased the city's historic Karlsplatz and was about to rename it "Nikeplatz", and in No Fun (2010) documented a simulation of Franco’s suicide in a webcam-based chat room with the real time responses of the participants. At a moment when the potential of the net and social media to affect political change is manifest, their practice reflects this urgency. Selected solo exhibitions include Feldman Gallery, Portland; Site Gallery, Sheffield; Galeriji Vigalica, Ljubljana; [plug.in], Basel; Postmasters Gallery, NY. Their work has been included in numerous group shows and biennials such as Collection Lambert, Avignon; Lentos Kunstmuseum, Linz; New Museum, New York; NTT ICC Museum, Tokyo; Manifesta, Frankfurt; Performa, New York; MoMA PS1, NY and the Venice Biennale. They received the Jerome Commission from the Walker Art Center and a fellowship from Columbia University, NY. Mary Mattingly is a Brooklyn-based visual artist best known for Swale, a floating food forest for New York. Mattingly’s work has been exhibited at the International Center of Photography, the Brooklyn Museum, the Palais de Tokyo, and in the Havana Biennial, among many other institiutions. With the U.S. Department of State and Bronx Museum of the Arts she participated in the smARTpower project, traveling to Manila. In 2009 Mattingly founded the Waterpod Project, a barge-based public space and self-sufficient habitat that hosted over 200,000 visitors in New York. Mattingly has been awarded grants and fellowships from the Yale University School of Art, the Harpo Foundation, NYFA, the Jerome Foundation, and the Art Matters Foundation. Her work has been featured in Aperture magazine, Art in America, Artforum, Sculpture, The New York Times, New York, The New Yorker, The Wall Street Journal, Brooklyn Rail, and the Village Voice; and on BBC News, MSNBC, Fox News, NPR, WNBC, NY1, and on Art21's New York Close Up series.